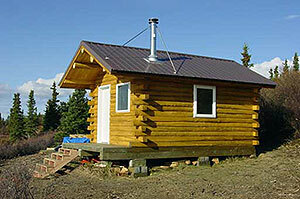 The Division of Sport Fish manages six public-use cabins located on fishing lakes in Interior Alaska. These cabins are available without fee by advance reservation only, and these reservations must be made by phone or in person during normal office hours at (907) 459-7228. Reservations may be made up to six months in advance, for stays of up to five consecutive nights. More information regarding these public use cabins is available at (907) 459-7228. 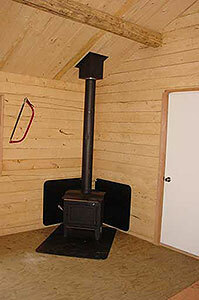 Each cabin has 4 bunks, a table, and a woodstove, with an outhouse nearby. 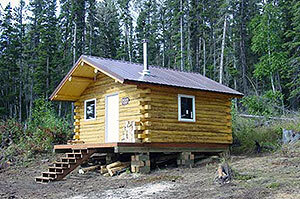 Users of these cabins must PROVIDE THEIR OWN FIREWOOD, as the cabins do not come with wood provided, and there is no dead, dry wood available anywhere near the cabins. Cabin users also must provide their own PAPER PRODUCTS, cooking equipment and utensils, lanterns, and sleeping pads for the bunk beds. Users will receive a reservation confirmation certificate by mail, fax, or email, and should carry a copy with them on their stay. See a video about ADF&G Public-Use Cabins. 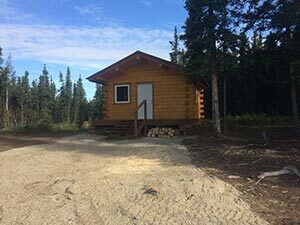 The Lisa Lake cabin is located on the northwest shore of Lisa Lake, a small (~50 acres) lake located a near the Johnson River, a mile west of the Alaska Highway, about 40 miles southeast of Delta Junction. 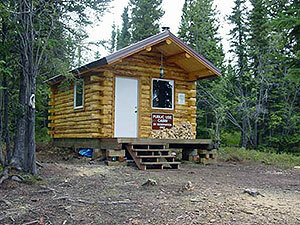 The cabin is accessed by an overland trail about a mile long, beginning at a highway pull off/parking area at mile 1381. Much of the trail is unimproved, boggy and muddy, and rubber boots are recommended in the summer. Lisa Lake is stocked with rainbow trout, and fishing is often productive, especially just after the ice goes off of the lake in late-May. 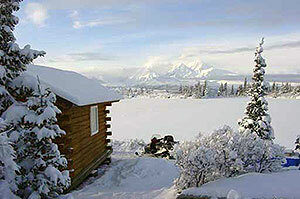 The cabin looks out towards the south with a great view of the Macomb Plateau. There is a short walking trail from the southwest end of the lake over to the floodplain of the Johnson River. Users should remember that they must provide their own firewood, as there is no dead or dry wood anywhere near the cabin. No PAPER PRODUCTS, cooking equipment or utensils, or lighting equipment is provided, and there are no sleeping pads on the bunk beds. 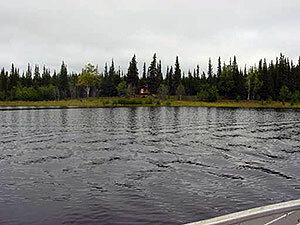 The George Lake cabin is located on the northeast shore of George Lake, a large (6+ square miles) lake located across the Tanana River from the Alaska Highway, 37 miles southeast of Delta Junction. 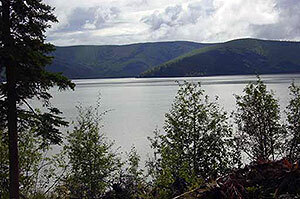 The lake is accessed from George Lake Landing, where there is a short road from the turn-out at Alaska Highway mile 1385 down to an unimproved boat launch on the Tanana River. There is excellent fishing for both northern pike and burbot at George Lake, and Arctic grayling can be caught in George Creek. The most popular fishery at George Lake is the spring northern pike fishery, which takes place in March and early-April, and then again in June. George Lake is closed to fishing for northern pike from April 21 to May 31 to protect fish during the spawning period. The lake is usually accessed by snowmachine between late-November and mid-April, by way of a 4-mile overland trail from the north bank of the Tanana to the lake outlet. Access from breakup through freeze-up is by jet boat via the Tanana River and George Creek. George Creek is quite small, and low water in late-summer can make boating the river challenging or impossible. The lake can also be accessed by float and ski plane as conditions allow. Users should remember that they must provide their own firewood, as there is no dead or dry wood anywhere near the cabin, and virtually all of the lake is surrounded by private land. No cooking equipment or utensils, or lighting equipment is provided, and there are no sleeping pads on the bunk beds. Coal Mine # 5 Pond is a small (~ 5 acres) stocked lake in the foothills of the Alaska Range, about 2 miles up the Coal Mine Road off the Richardson Highway, 24 miles south of Delta Junction. The Coal Mine Road begins at Richardson Highway mile 242.1. The Coal Mine Road is not passable by standard automobile, and requires the ground clearance of a truck or SUV. During the summer months, many users drive the Coal Mine Road to within 1/2 mile of the cabin, but you can not drive all the way to the cabin in a highway vehicle. The road is not plowed during the winter, and users normally access the cabin by snowmachine from a parking area off the Richardson Highway. The lake is stocked with rainbow trout, and several of the other lakes off the Coal Mine Road are also stocked with either rainbow trout, Arctic char, Arctic grayling, or Chinook salmon. Users should remember that they must provide their own firewood, as there is no dead or dry wood anywhere near the cabin, and wood cutting is prohibited by BLM, the land manager. No PAPER PRODUCTS, cooking equipment or utensils, or lighting equipment is provided, and there are no sleeping pads on the bunk beds. Kenâ€™s Pond is a small (~ 5 acres) stocked lake in the foothills of the Alaska Range, about 4.5 miles up the Coal Mine Road off the Richardson Highway, 24 miles south of Delta Junction. The Coal Mine Road begins at Richardson Highway mile 242.1. The Coal Mine Road is not passable by standard automobile, and requires the ground clearance of a truck or SUV. During the summer months, many users drive the Coal Mine Road to within 1/3 mile of the cabin, but you can not drive all the way to the cabin in a highway vehicle. The road is not plowed during the winter, and users normally access the cabin by snowmachine. The lake is stocked with rainbow trout, Arctic char, and several of the other lakes off the Coal Mine Road are also stocked with either rainbow trout, Arctic char, Arctic grayling, or Chinook salmon. 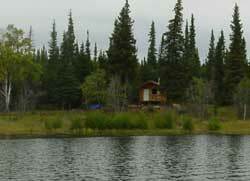 The Donna Lake cabin is located on the north shore of Big Donna Lake, a small stocked lake located south of the Alaska Highway just east of the Gerstle River. The trailhead is about 30 miles southeast of Delta Junction, on the right at mile 1391.7 of the Alaska Highway, where there is lots of parking and a double-ended turnout with an ATV/snowmachine loading ramp. There is excellent fishing for rainbow trout at Big Donna Lake, and beautiful views of the Alaska Range. The lake can be accessed by walking or by ATV during the summer months, and by snowmachine between late-November and mid-April, by way of a 4-mile overland trail. 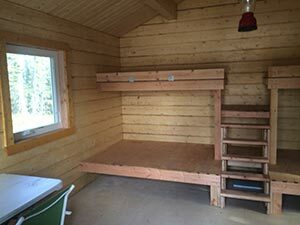 The cabin is 16 x 16, and includes a wood stove, table, and 4 bunks, but users should remember that they must provide their own firewood and paper products. There is an outhouse behind the cabin. No cooking equipment or utensils, or lighting equipment is provided, and there are no sleeping pads on the bunk beds. There is no fee to use the cabin, but use of the cabin is by reservation only. 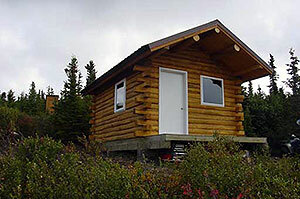 The Little Donna Lake cabin is located on the north shore of Little Donna Lake, a small stocked lake located south of the Alaska Highway just east of the Gerstle River. The trailhead is about 30 miles southeast of Delta Junction, on the right at mile 1391.7 of the Alaska Highway, where there is lots of parking and a double-ended turnout with an ATV/snowmachine loading ramp. 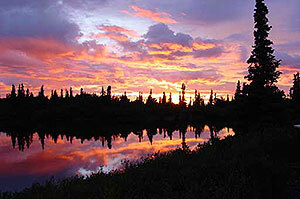 There is excellent fishing for rainbow trout at Little Donna Lake, and beautiful views of the Alaska Range. The lake can be accessed by walking or by ATV during the summer months, and by snowmachine between late-November and mid-April, by way of a 5-mile overland trail. This is the same trail used to access Big Donna Lake and continues on past the Big Donna Lake cabin to Little Donna Lake. The waypoint for the cabin is 63.76494 N ; 144.89090 W.
Reservations may only be made within six months of the anticipated stay, may only be made for 5 consecutive nights, and can only be made by phone at (907) 459-7228 or in person at the ADF&G office in Fairbanks. Dates highlighted with a green bar with the cabin name show that that cabin is already reserved for the night of that date. You may check in after noon on the first day of your reservation and must check out by noon on day after the last night of the reservation.